Kaiser Wilhelm II, who ruled the German Empire and the Kingdom of Prussia from 1888 to 1918, portrayed here dressed as a British Admiral of the Fleet, an honorary title given to him by his Grandmother, Queen Victoria. He last wore this uniform on 26 June 1914 when he met ships of the Royal Navy paying a ‘courtesy visit’ to the German naval base at Kiel – just 39 days before the First World War began and things got less courteous. Tim Koch sees the Kaiser in a new light. While the British claim to have invented (or at least codified) rowing as a sport, Germany and Austria-Hungary were among the earliest and most enthusiastic of the countries that subsequently adopted it as a popular pastime, both quickly developing their own traditions. Firstly, the ruderclubs often had attached restaurants and cafes that were open to all and which must have brought in a welcome income. Secondly, there was – and is – a tradition not just of racing boats over short distances, but also of long-distance touring in slow and stable craft. I suspect that the latter less demanding pastime kept a large membership on the books, effectively subsidising the racing members. Both of these factors may have made many Germanic clubs more family orientated and women-friendly than their strictly ‘men only’ equivalents in the UK. 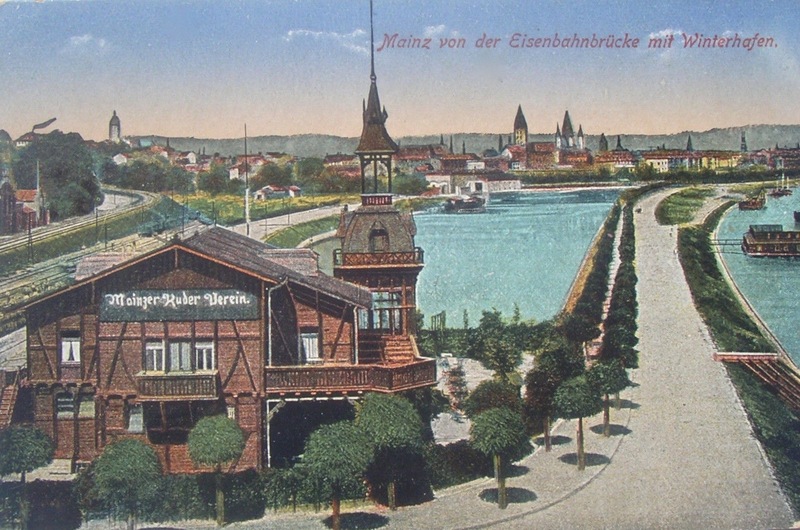 Below are some pictorial examples of impressive German boathouses. 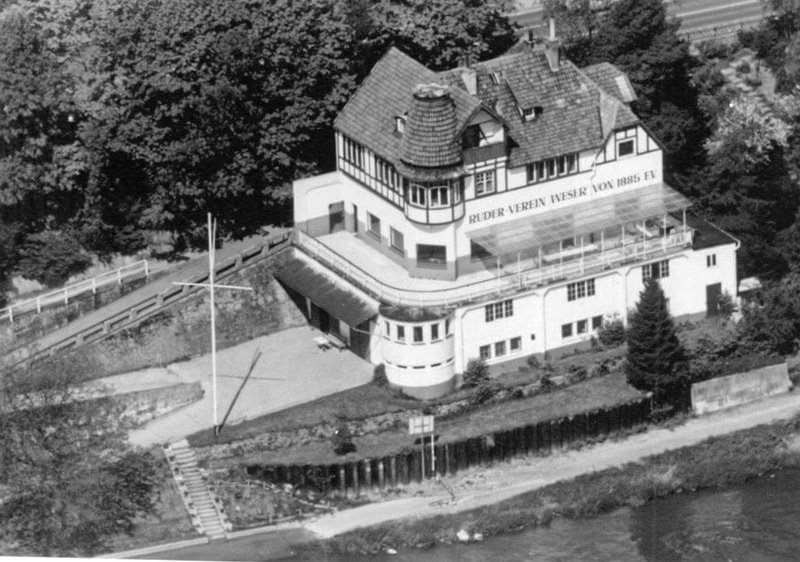 As to the club names, ’ruderverein’ or ‘ruder-verein’ is German for ‘rowing club’ or ‘rowing society’. Some German clubs use this in their title, others go with ‘ruderclub’ or ‘ruder-club’. Others choose to use the German ‘klub’. The word ‘ruder’ can refer to a rudder, a scull or a sweep oar – it depends on the context. 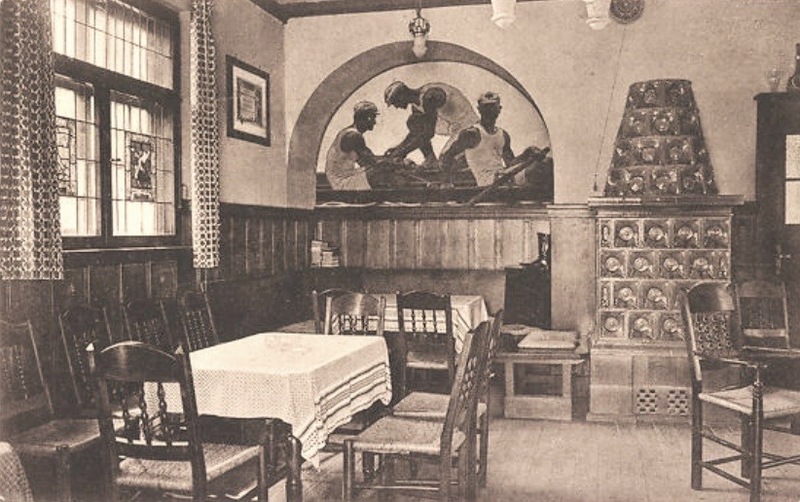 Ruderclub ‘Neptun’, founded in 1882, based in Meissen, Saxony. The interior of Ruderclub Neptun. 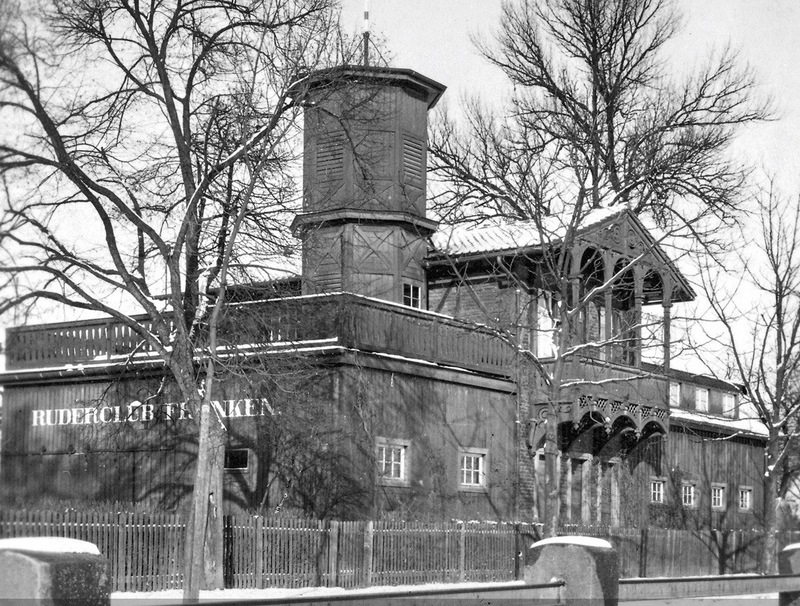 Ruder-Club ‘Franken’, founded in 1882, based in Schweinfurt, Bavaria. 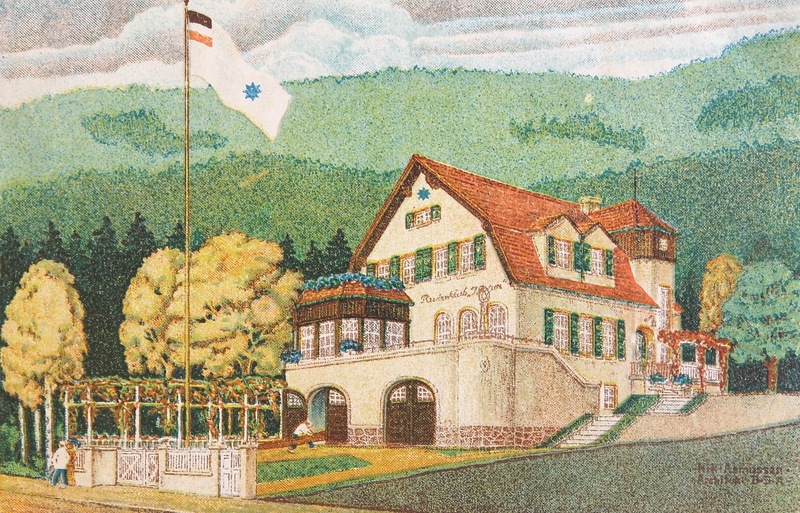 Mainzer Ruderverein, founded in 1878, based in Mainz, Rhineland-Palatinate. Ruderverein ‘Weser’, founded in 1885, based in Hameln, Lower Saxony. Ruderverein ‘Nautilus’, founded in 1877, based in Elbing, then in East Prussia, now in northern Poland. Ruderverein ‘Sturmvogel’, founded in 1883, based in Leipzig, Saxony. 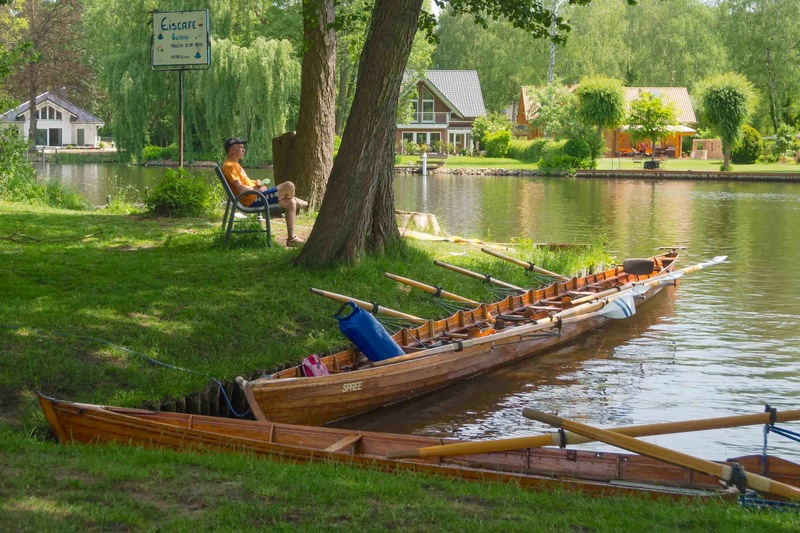 My article produced an enthusiastic response from Stephan Ploke, the President of Münster’s Akademischer Ruderverbindung Westfalen (Academic Rowing Fraternity of Westphalia). Rowing historian Tom Weil and I first met him a year ago in the bar at Leander when Stephan and his club mates were touring the Thames. Tom subsequently wrote about this meeting for HTBS. Emperor Wilhelm I, but particularly his son, Wilhelm II, who reigned from 1888 to 1918, wanted to raise Germany to a world-power and firmly believed that the key towards achieving this was a strong fleet that could match the British Navy. Hence they heavily invested in the Navy but also supported water sports to enthuse young people for anything maritime, of course with the ultimate goal that they would later join the Navy. In these decades there was a real mania for anything maritime (for example, little kids would wear naval outfits) and Wilhelm I and Wilhelm II donated many prizes for rowing regattas and visited many of them personally on the royal yacht Alexandria. Wilhelm II donated this trophy for the Akademischer Kaiservierer in 1895 – but also gave many other rowing prizes. 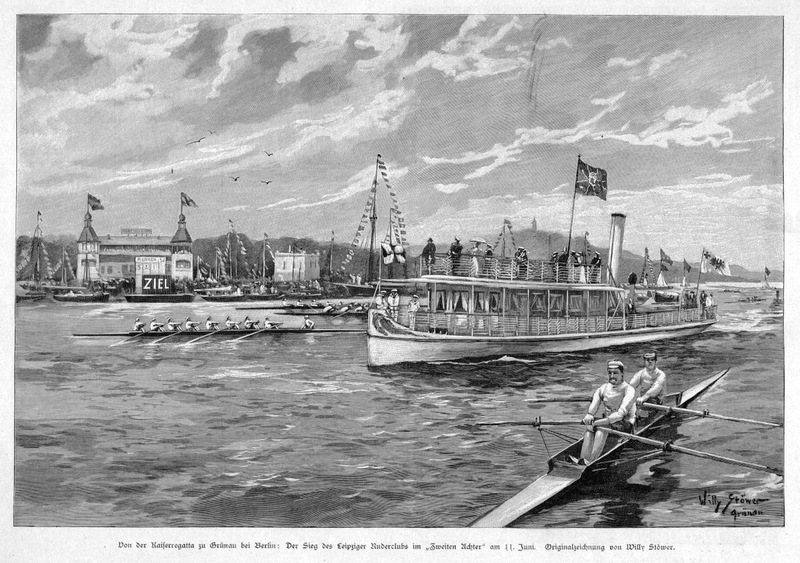 The Kaiserregatta in Grünau, Berlin, with the Emperor’s yacht in attendance. 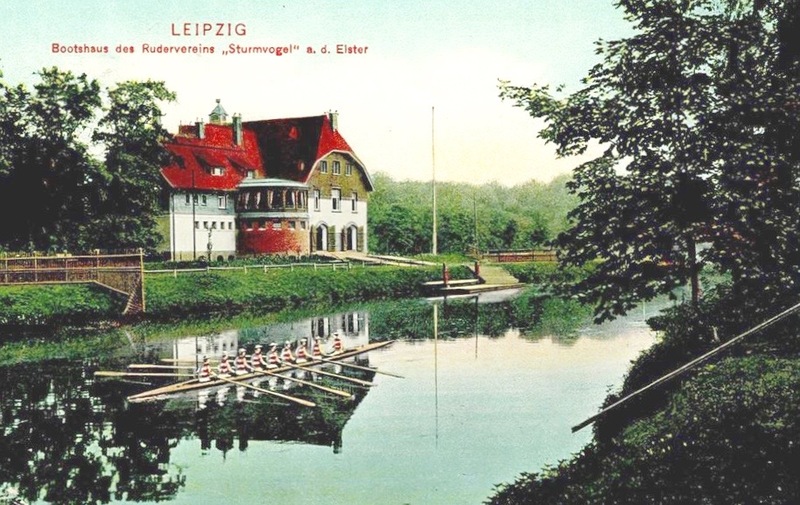 The aforementioned maritime enthusiasm is also mirrored by the parade of 600 rowing boats right in front of the boathouse of Akademischer Ruderverein Berlin on the occasion of the Emperor’s birthday – you have a postcard showing this in your article. 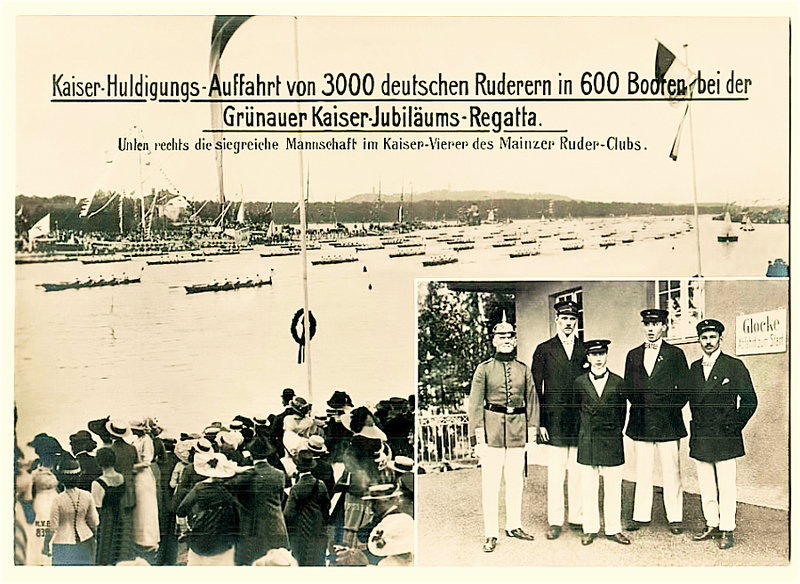 Grünau: A row past by 3000 rowers in 600 boats in honour of Wilhelm II’s 25th year as Kaiser. 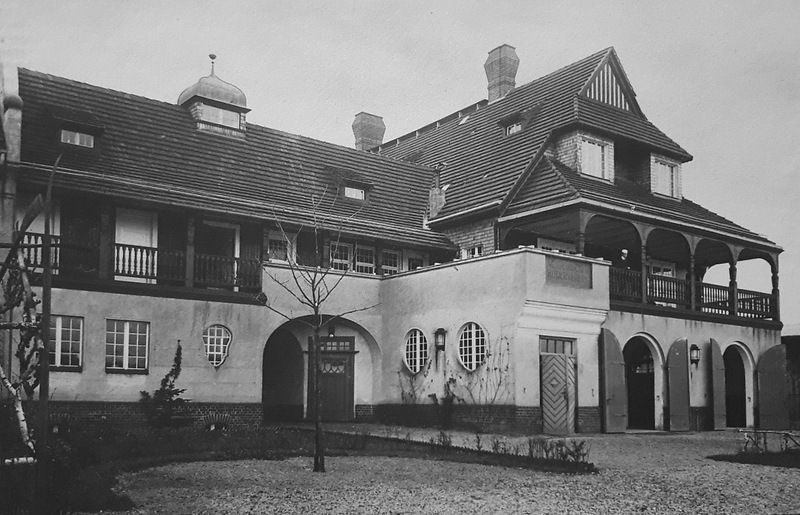 Fit for a King: The clubhouse of the Berlin Student’s Rowing Club, the Akademischer Ruderverein Berlin, pictured in 1912. 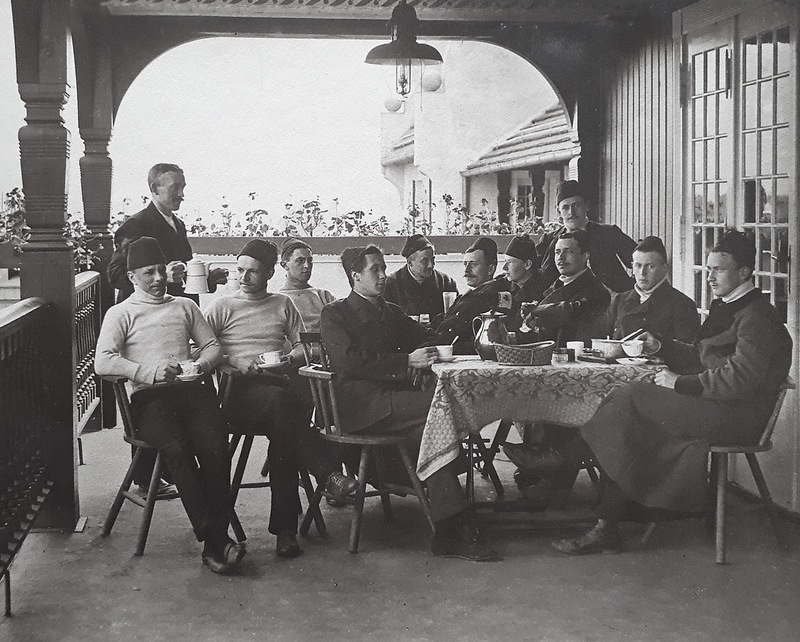 Members of the Akademischer Ruderverein Berlin enjoy coffee at the club. Stephan cannot explain the unusual hats. An interior view of the Akademischer Ruderverein Berlin. 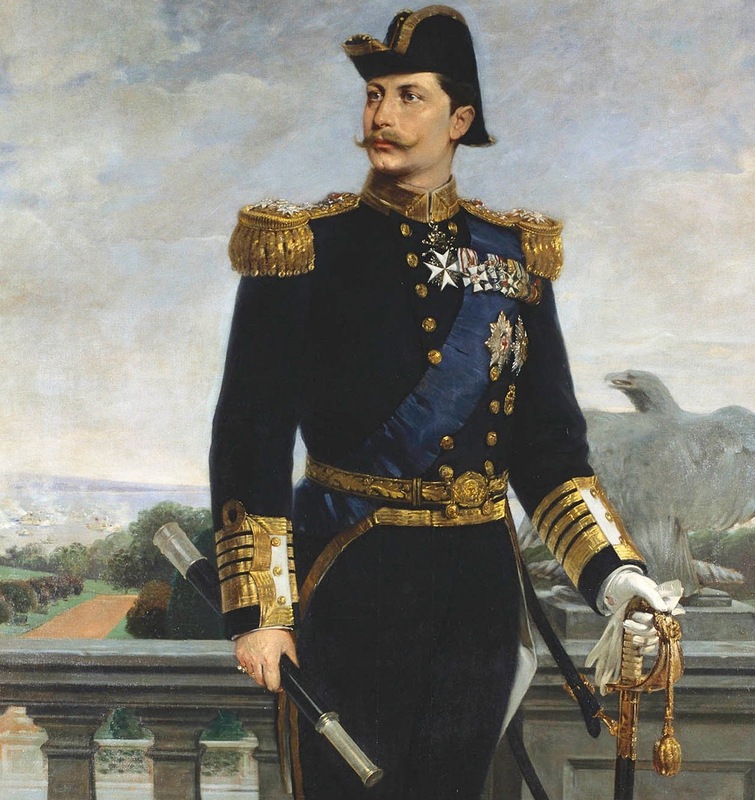 Stephan says that Wilhelm II donated the picture of himself shown in the photograph, one of only two hand signed portraits that he ever dedicated to a rowing club or fraternity. Germans are quite notorious for their love of founding a club for almost anything and they spend lots of time and personal resource in and on their clubs. 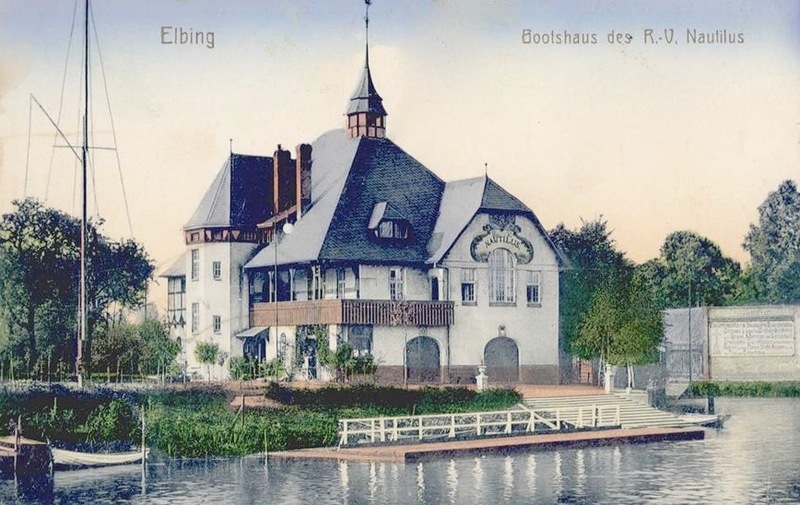 As such, particularly in the old times, whole families would join the rowing clubs and not just come there to row, but also spending more time there, eating there, having coffee, playing billiards or just hang out, sometimes the entire weekend, that why many boathouses have restaurants or cafes. And of course, this use as a second home increase the need for more elaborate structures but of course also the willingness to pay for it or donate to it. 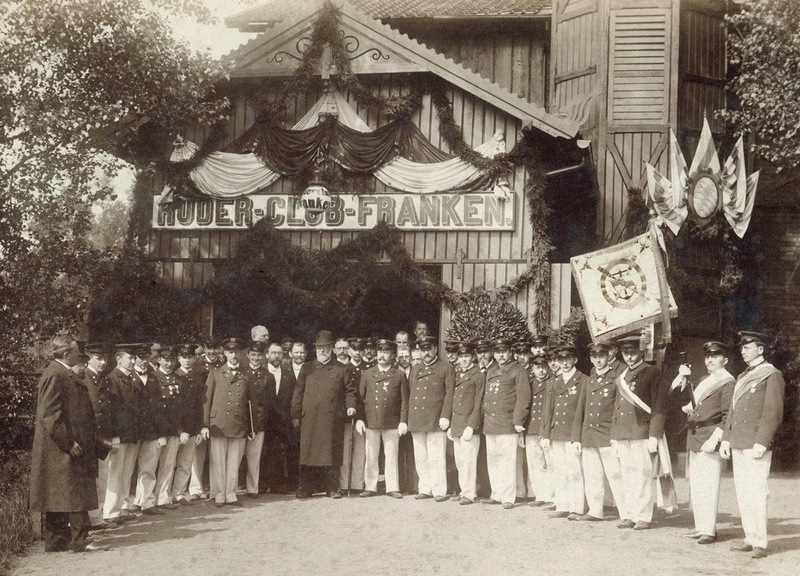 An example of influential people supporting rowing clubs: a visit by Prince Ludwig of Bavaria to the boathouse of Schweinfurter Ruder-Club Franken in 1903. 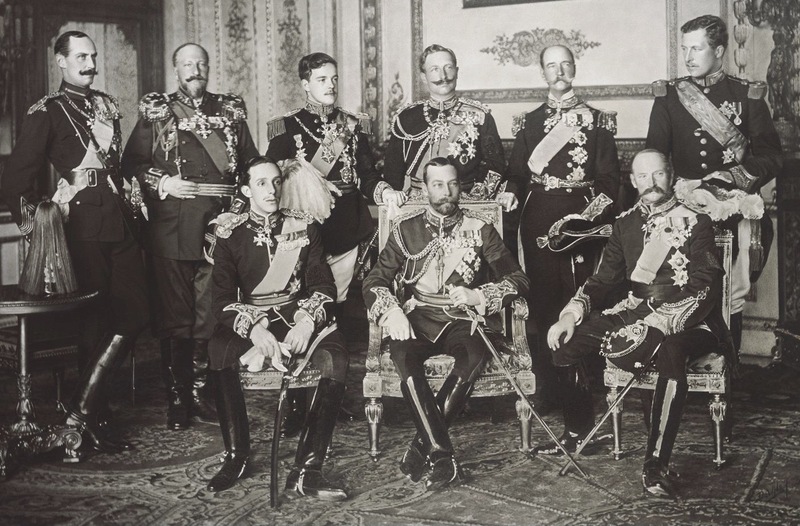 A picture included simply for its interest value – the only photograph of nine kings together, taken in 1910 at the funeral of Edward VII. Back, from left to right: King Haakon VII of Norway, Tsar Ferdinand of the Bulgarians, King Manuel II of Portugal and the Algarve, Kaiser Wilhelm II of Germany and Prussia, King George I of the Hellenes and King Albert I of the Belgians. Front, from left to right: King Alfonso XIII of Spain, King George V of the United Kingdom and King Frederick VIII of Denmark. 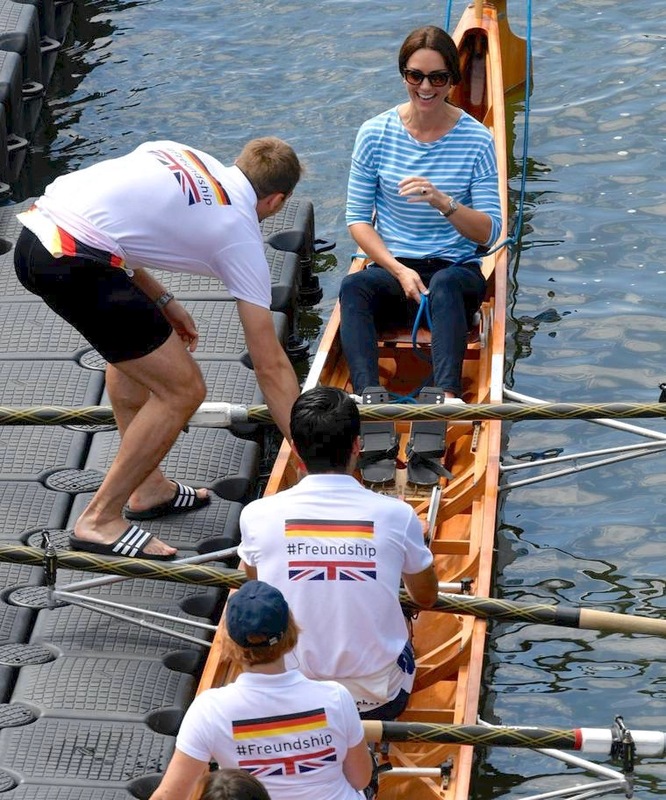 In my response to Stephan, I thanked him for his input and reiterated the fact that German rowing history is a source of great frustration to me as its riches almost certainly match that of Britain, but I can access so little information on it – even with the help of ‘Google Translate’. 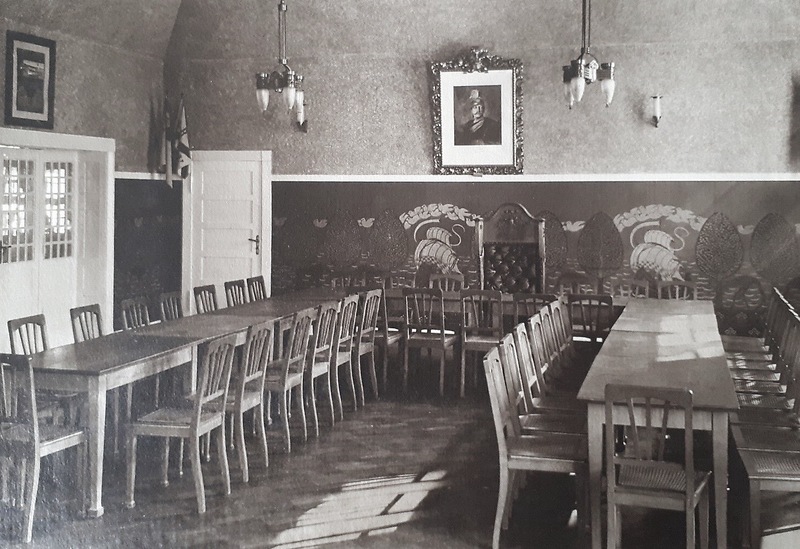 Thus, the high standard of buildings and equipment in German rowing clubs in the late 19th/early 20th century was in part due to the encouragement of, and practical support from, the Kaiser and his supporters in order to assist in making Germany a maritime power to match Britain. Did most clubs offer both touring and racing, or were there many that did only one type? Has the balance between the two changed much over the years? 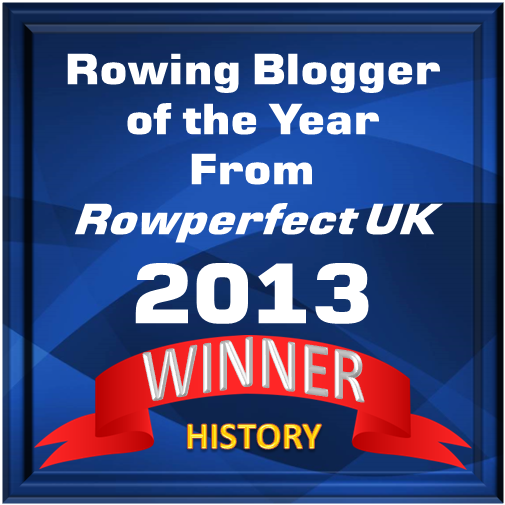 I think that British rowing has lost out by not having a tradition of touring. Even though the Victorians and Edwardians did a lot of this (‘Three Men in a Boat’ etc), it was not done out of rowing clubs, the boats were simply hired from commercial boatyards as required. 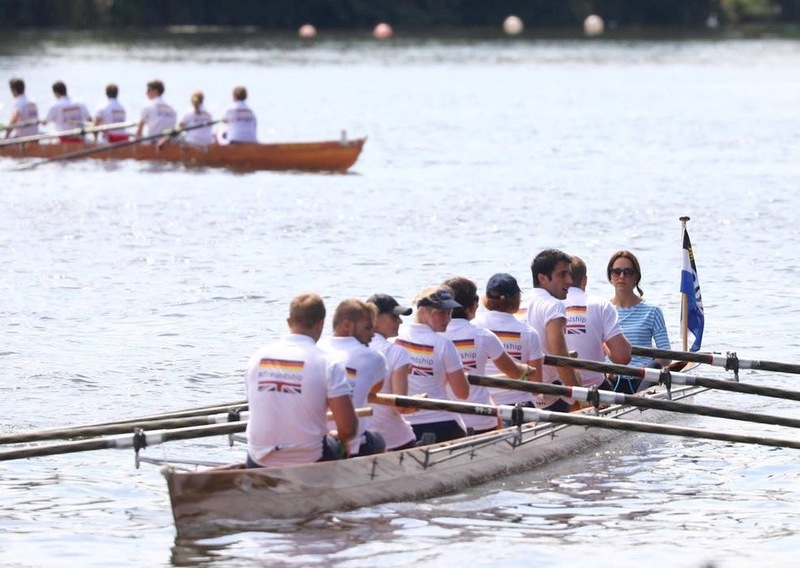 On a visit to Heidelberg in June 2017, the Duke and Duchess of Cambridge (Prince William and the former Kate Middleton) coxed against each other in a race on the River Neckar. The above two pictures show solid touring eights – though perhaps smaller boats are more common. The current state of touring around the world is summarised in this FISA document. 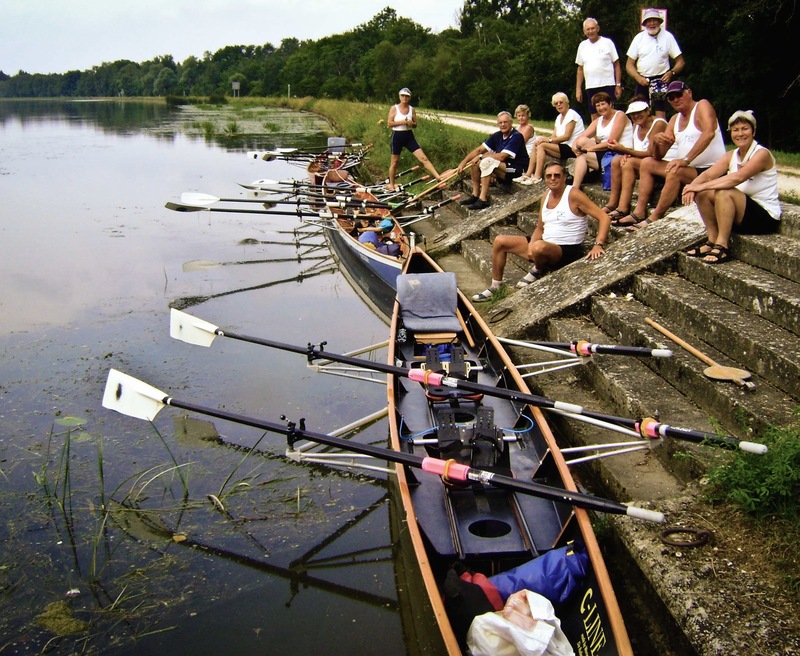 (Touring) is a quintessential part of German rowing – if not German rowing per se. I don’t know any club that does not do or offer touring, even the big racing clubs like Berliner RC, Frankfurter Germania, ETuF Essen or Allemannia Hamburg do it and I would estimate that touring or rowing in touring boats without any race-ambitions accounts for the majority of outings and the mileage in almost any German club. A traditional touring eight used by Ruder-Gemeinschaft Grünau. Ruder-Gemeinschaft Grünau also has the popular modern ‘C’ type touring boats. The coxed quad is 11 metres long, 80 cm at the widest point, and weighs 80 kg, about 20 kg heavier than a racing equivalent. There is plenty of room for spare kit and refreshments. 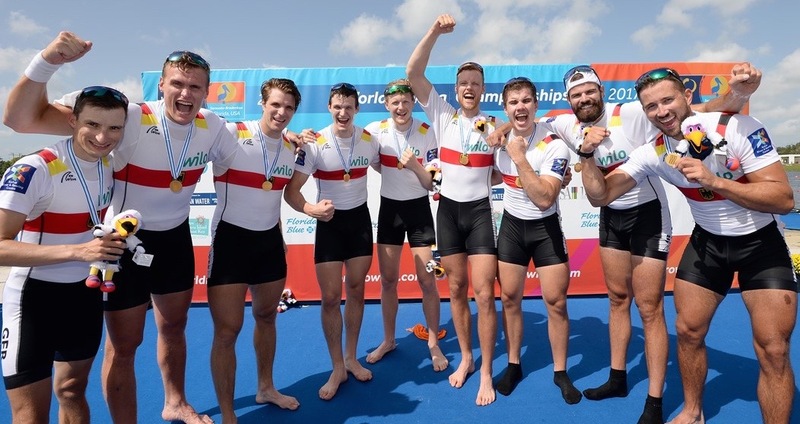 Racing and training for is traditionally limited to very few rowers/crews per club and typically targets at developing rowers for the junior or senior national teams, but there is hardly anything in between, i.e. 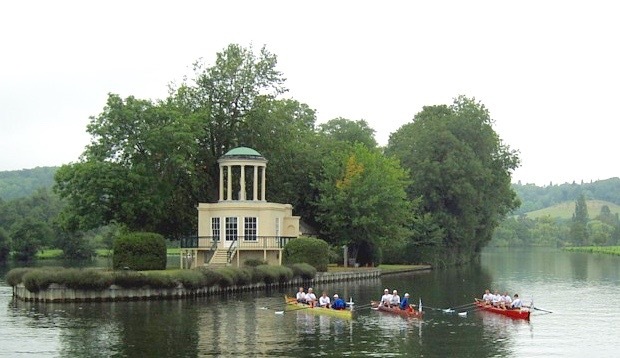 other than in the UK, there is nothing like second level club crews competing in races like the Head of the River, Henley Club Events or the numerous senior races at regattas like Maidenhead, Marlow or Metropolitan and the like. I am a big critic of this practice which results in the fact that there are very limited options for rowers who realise they won’t make the team: you either row in the touring groups which is not really what you want if are 20 and came back from the junior nationals or you quit rowing. The establishment of the “Bundesliga” i.e. the series of 350m sprinting races with an overall winner has been a semi-successful attempt to offer an alternative and to keep athletes in the clubs. Moreover, many, mainly smaller and provincial clubs, do not even offer racing at all, as they fear the high costs of training and races, i.e. for boats, coaches, travelling etc. Although Stephan is critical of the German domestic set up, the nation’s international crews are still amongst the best in the world. This is the German Men’s Eight, World Rowing’s Male Crew of the Year for 2017. You are right in your assumption that in a typical club the touring fraction subsidises the racing squads and the boathouses and I would also agree with your statement that the average standard of German boathouses is well above their UK counterparts (with exceptions like Leander of course) which, on the contrary, typically house many more racing shells. 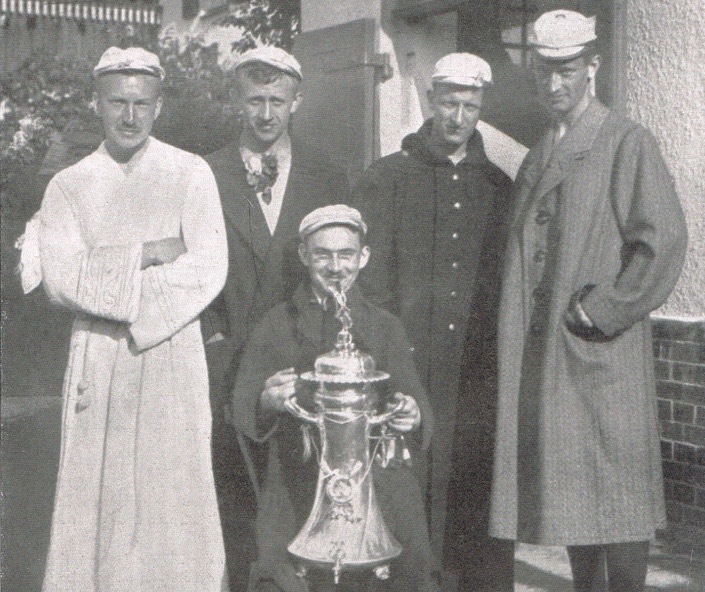 As to your last question, I don’t think that the overall balances between touring and racing has shifted notably in the last century in general, of course in certain clubs it has, but this is typically dependent on the people and club board pushing one or the other aside! In the end, the two systems in the UK and Germany are completely different with numerous pros and cons on both sides. Great stuff, Stephan, danke schön.